With all of the holiday dinners, parties and events that you have coming up, I wanted to make your life a little easier when trying to figure out what to wear this holiday season! Not only is it a struggle when it comes to knowing what to wear, but also, budget’s are tight. So, how do you afford 5 different outfits for 5 different holiday parties? No need to even go there! 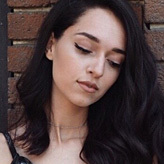 I have compiled 7 items and trends which you probably already have in your closet or you can find for fairly cheap that can be interchanged to create multiple different looks. Read on for my top 7 style picks for this holiday season! 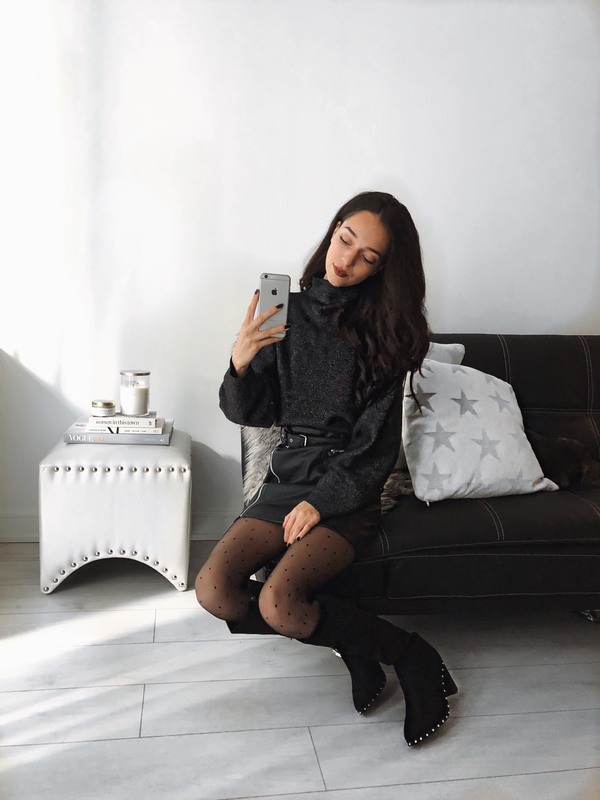 One of my favourite trends for the Fall/Winter season has to be patterned tights! These polka-dot tights are from the cutest brand from Montreal called, From Rachel, who will satisfy all of your patterned tight dreams. I just HAD to include this trend in my holiday style guide because come on, how cute!? Paired under any dress or skirt, your outfit becomes instantly trendy and holiday-ready! 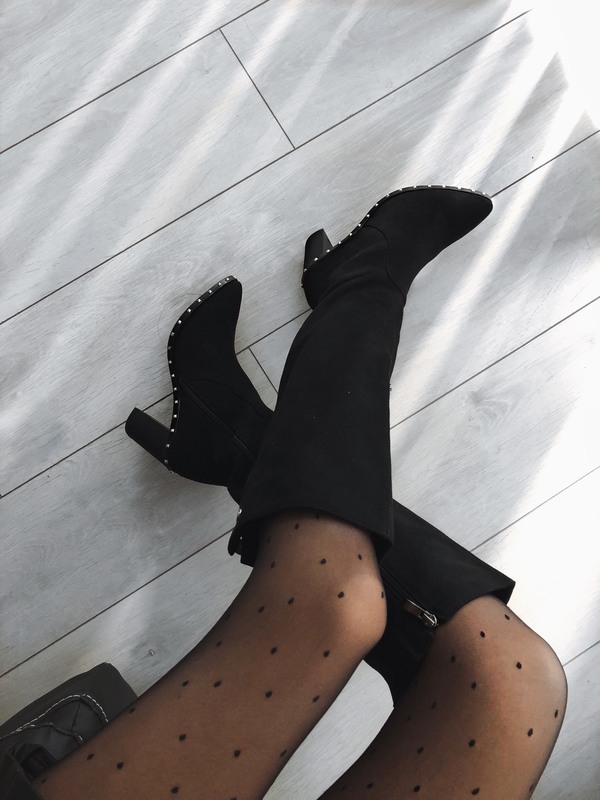 The most versatile shoe for the holidays has to be the knee-high boot. Dressed down with a pair of skinny jeans or dressed up with a skirt or dress, you are seriously ready for any holiday/winter situation. These are from VIVO ROSA, who have a ton of affordable and trendy shoe options for the holiday/winter season. Also, they might be the most comfortable boots ever. Wait, shoes that are affordable and comfortable, what!? 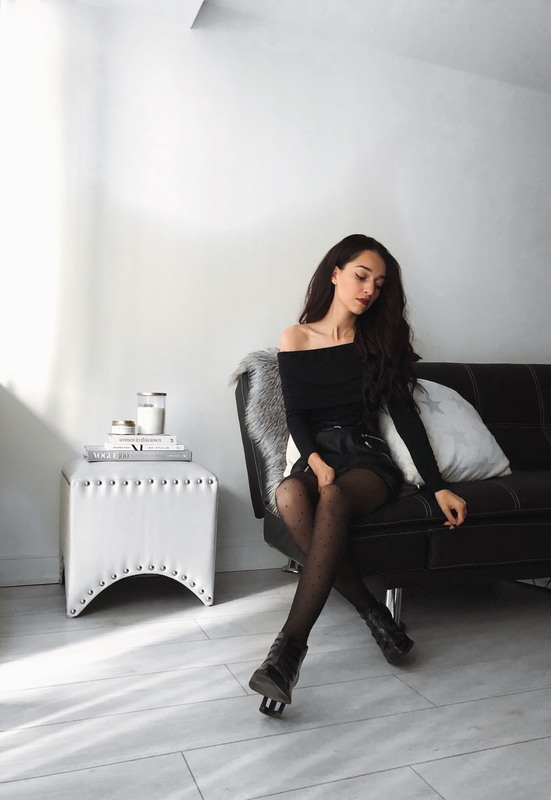 My second favourite trend for this holiday season has to be the pleather skirt. They are everywhere right now, so it won’t be tough to find an affordable option. Shop some options here from Dynamite all for under $50! Paired with a knit sweater or blouse, the pleather skirt makes your outfit dressy & trendy enough to wear to any holiday party. Hey, here’s a good idea, why not pair your patterned tights with the skirt as well? Is it possible to go through the holidays without wearing something sparkly? Well, I sure couldn’t resist! The best part about this is that sparkles and glitter are actually really trendy and in-style this year. So, it’s time to bring out that sparkly dress you have always dreamt of wearing for the perfect occasion! This sweater is from H&M and I am so excited to wear it this holiday season! My absolute favourite colour to wear during the holidays year after year has to be burgundy. It is a Fall/Winter colour that seriously never goes out of style! 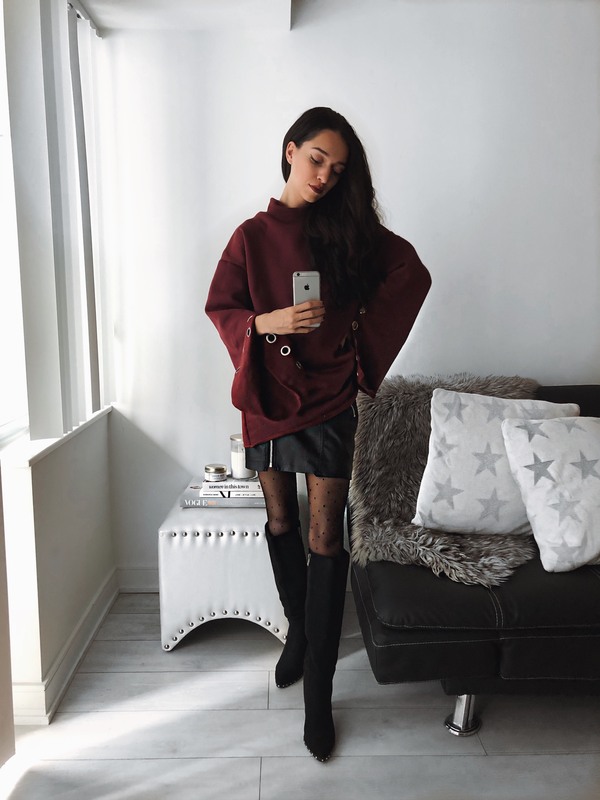 Whether it is a burgundy sweater, blouse, skirt, jacket, or all of the above, you cannot go wrong with something burgundy for the holidays! This colour is INSTANTLY trendy. This sweater is from a Toronto based online shop called, The Concept 6. Want to add a little bit of a classy-yet sassy flare to your holiday look? A perfect way to do this is with an off the shoulder top. It is such a subtle way to take your look to more of a dressy level, while remaining chic and trendy as well. Wait, but get this…this top was only $22.99 at Urban Planet. Yup, you are welcome! Shop this top from Urban Planet here. One of the most perfect ways to finish off any holiday outfit is with some silver accents. It adds the perfect amount of shine and holiday inspired touch to any look and a must-have for my holiday style guide! 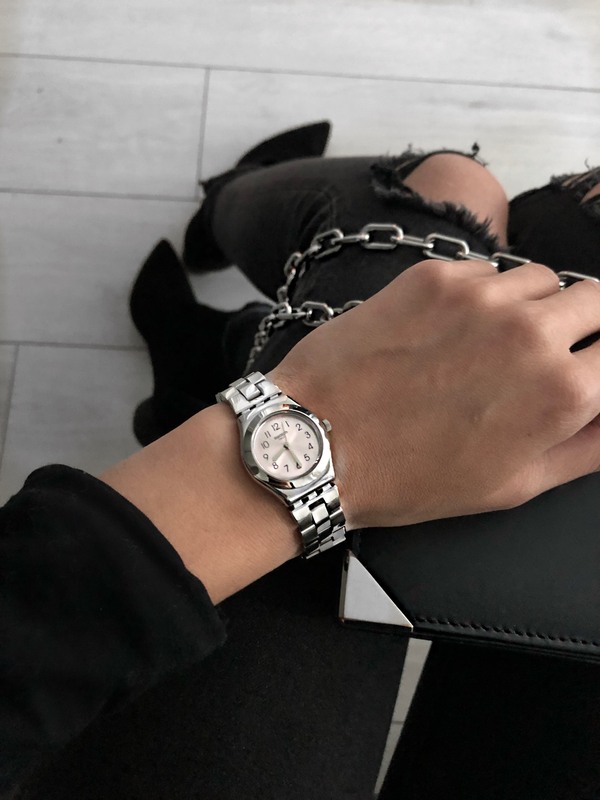 One of my favourite pieces to wear is a classic, minimal, silver watch. This one is from SWATCH, which you can shop here, and is the perfect piece to any more dressed down or dressed up look. Time to dig around your jewelry boxes as well to see what other silver treasures you can find for your holiday outfits!